In February 2006 we witnessed the terrible power of drawing in the reaction of insulted Muslims to the perceived profanity of some cartoons depicting Allah. What a mighty tool the ink pen is. Just marks on a piece of paper, a drawing can convey a message sufficiently powerful to rock the world. Now, in the 21st century, that power is potent as it ever was. I was reminded of this power of drawing—in a more positive but still contentious way—by the invitation card to the projection of Ken Mullin’s film across the north face of Torness Nuclear Power Station. On it, a drawing by Richard Demarco was drafted with vision and fluidity, well in advance of the event, presenting a mystical version of the already beloved Skateraw (Demarco’s gallery in a barn on a farm) alongside a luminous Torness with moonlight and stars. Ken Mullin’s work, as well as Demarco’s collective vision for the whole environment, was implied without revelation. 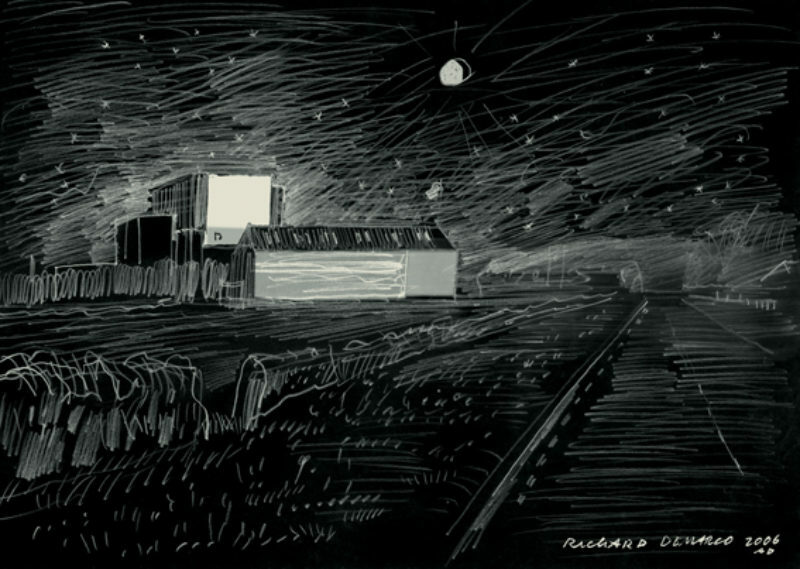 This drawing fascinates as a mental projection of a future event—the screening of a film on a vast scale, drive-in movie style, with Torness as backdrop. Despite all the science involved in both the inspiration for Lumin de Lumine and in its execution, it was ultimately the power of a good drawing that was able to condense all the ingredients and bring us running to bear collective witness to this oneoff screening. Despite all the metaphors—and despite the ongoing particle research represented by the Swiss laboratory CERN, which inspired the film—it was art that took us there. On the night, Skateraw became a venue not only for the archives of the Demarco collection, but also for the ‘Theatre of Anticipation’ of a large and creatively engaged selection of people. The project beautifully demonstrates not only the co-existence of science and art, but also their separateness. However visionary they are, scientists describing art offer no sense of timing or theatre or art. They can make something as extraordinary and scary as nuclear fission sound banal, quotidian even. On this occasion, it is Demarco who takes something quite ordinary, and renders it extraordinary through his introduction, his drawing and his awe at the world and at all the artists who seek to describe it. The film we saw, a short on continuous repeat, was a wonder from all angles. Marking time and space with a dancer in a red dress swinging a light bulb, it was beautiful and mysterious and not a little frightening. But it was a drawing that took us there in the first place. Now that’s power.